Elegant Sycamore plan with beautifully designed addition on one of our favorite Palm Valley streets. Quiet cul-de-sac location, beautiful morning sun from the east facing patio, large greenbelt adjacent to the home. Lovingly improved throughout with opened kitchen area, large granite counter/island workspace, stainless appliances, custom cabinetry. Spacious living/dining, 3 bedrooms. 3 full baths, all with lovely upgrades, walk in showers, custom cabinets, counters, lighting. Owners have added a beautifully designed office space with twin work spaces off the master bedroom suite. Lots of storage, direct garage access. Tropical desert scape surrounds the walk and fairway patio. 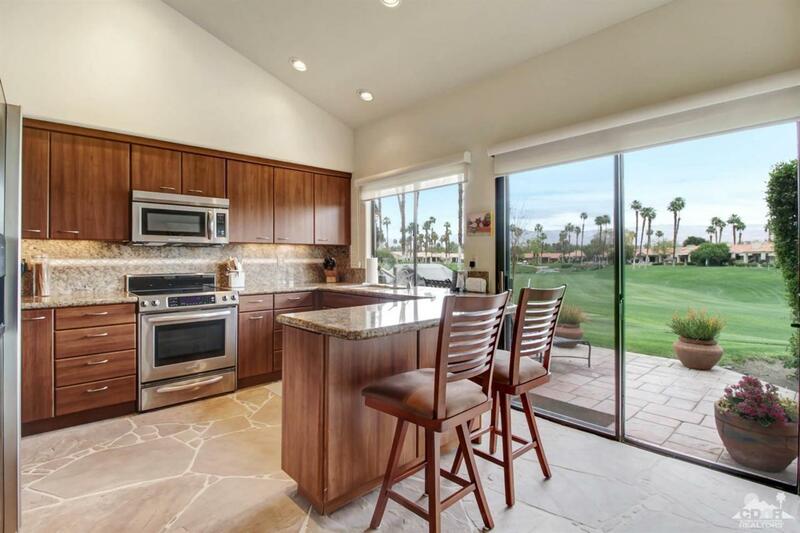 Enjoy the expansive fairway and water views from your patio. Custom touches throughout, solar lights, custom closets, newer appliances, finished garage, immaculate, lots of storage. Offered unfurnished. Newly installed AC,HW heater, attention to every detail! Beautiful, warm, perfect for full time living.